Superoxide dismutase is an enzyme that converts free oxygen radicals to peroxide and to molecular oxygen. 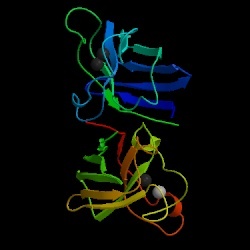 The active enzyme is a homodimer, i.e. it contains two molecules of the same polypeptide. Each polypeptide contains one copper and one zinc ion. The folding pattern is a "Greek key" formed of beta strands. . The molecule is very widespread, and has been identified in many species from bacteria to humans. Because of its antioxidant activity, the enzyme is a great medical interest. Some cases of familial ALS (Lou Gehrig's disease) have been associated with mutations in this enzyme. In the music, the 153 amino acid sequence of the protein is played through 3 times. The first read-through is a duet between oboe and flute, playing the more polar (water-soluble) and nonpolar (water-insoluble) amino acids respectively. In the second repetition of the sequence, other instruments represent the regions of secondary structure: trumpets for the beta strands, chimes for alpha helix, and tubular bells for the turns. The remainder of the sequence is played in this section by a harp-string combination of voices. In the final section, the duet between polar and nonpolar voices becomes a trio, with a second oboe playing the polar amino acids using a slightly different scale. Throughout the piece, the DNA sequence accompanies the amino acid sequence as a series of triple beats from a percussion section. This second voice is an allusion to the dimeric form of the active enzyme.